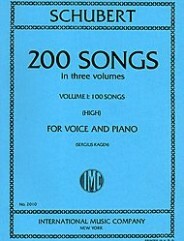 200 Songs in three volumes. 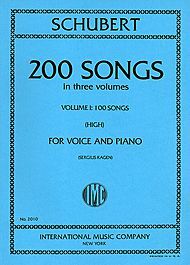 (Volume 1: 100 Songs). By Franz Schubert. For high voice solo and piano accompaniment (high voice). Contains all the cycles plus 42 Selected Songs. Romantic Period. Difficulty: medium. Collection. Vocal melody, lyrics and piano accompaniment. Published by International Music Company (2010). With vocal melody, lyrics and piano accompaniment. Romantic Period. 9×12 inches.